Tigella Bella is a unique and unconventional culinary experience which has been rapidly growing in Italy since 2004. Our restaurants serve a regional specialty typical of northern Italy, known as “Tigella,” a disc shaped bread with a soft centre and a crisp crust. When eaten, Tigella is split open with a knife, then filled in a variety of ways with traditional Italian cold cuts, cheeses, toppings and our “Creme Dolci”. authentic ingredients with no added preservatives or colour additives. We have combined 10 years of experience and modern technologies to find the perfect recipe using the best flour, water, olive oil, salt and yeast. We then allow the dough to mature and rise slowly for 24 hours, making it is especially crispy and light. 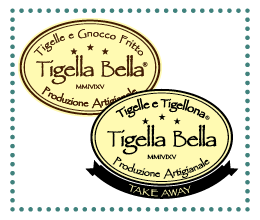 Tigella Bella is a combination of the quick service restaurant model with elements which characterise the Italian dining experience; passion for food; high quality standards and friendly atmosphere.